Digitizing Drawing | Show case Artist which work in melding traditional methods of Fine Art and digital technologies, Tech tips, Tech reviews and Fine Art. Cool insight on his method and apps. Yes he uses Brushes. If i had an iPad I would buy this!! Perhaps an iPad for my birthday. Ethno Tekh at Media Lab Melbourne’s OPEN LAB Performance. 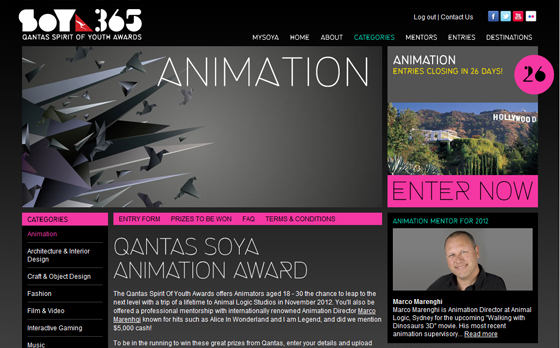 The Qantas Spirit Of Youth Awards offers Animators aged 18 – 30 the chance to leap to the next level with a trip of a lifetime to Animal Logic Studios in November 2012. You'll also be offered a professional mentorship with internationally renowned Animation Director Marco Marenhgi known for hits such as Alice In Wonderland and I am Legend, and did we mention $5,000 cash! To be in the running to win these great prizes from Qantas, enter your details and upload examples of your work to support your submission via the Entry Form. We're looking for original works that demonstrate your own point of view, and information on your experience or experiments in your chosen field – anything that shows us just how talented you are! Related fields / disciplines: All forms of animation welcome. Short Animations. AV and Experimental works. Animations may be in all popular formats, e.g. MOV, MP4, AVI, FLV. Make sure you spend a little bit of time transferring clear, good quality versions of your work to DVD, and telling us about your background, goals and point of difference: it could make a big difference to your entry! For a chance to win submit your work now, Click here.